Attempts are being made to set up a new umbrella organisation of people involved in campaigning about disability matters. Called the National Disability Organisation, the rationale for it is aptly summed up in Jayne Linney’s recent blog. DWP brown envelope arrived today. Result of ‘Mandatory Reconsideration’. No change. What a surprise! Who would have guessed? I do wonder how many people go for mandatory reconsideration and then give up. Probably quite a lot of deserving folk for whom the whole process is just too much. Does mandatory reconsideration ever reverse a decision or is it just another ploy to wear down tired old gits like me? How far is 20 metres? ‘Less than 20 metres’ is completely different to ‘no more than 20 metres’. One definition includes 20 metres, the other doesn’t. DWP have introduced confusion over whether a distance of 20 metres qualifies claimants to extended or standard mobility by introducing an application form that does not mirror the regulations. So which definition are DWP using to determine eligibility? Doh! The difficulty is that I have been given standard mobility award because during the assessment I used the term “up to 20 metres” According to the case manager, if an applicant mentions 20 metres, e.g. says ‘up to 20 metres’ like I did, the assessor will automatically put him/her into the longer category. Another bit of benefit saved! Well, the big brown envelope dropped onto the mat this morning and I opened it with some trepidation. Bad news! For mobility, they have decided contrary to all the evidence that I can walk much further than I actually can, so it’s only 10 points here and a move from enhanced to standard. This means that I lose my Motability car early in the New Year. … my new appointment is in Birmingham! [Edit] I finally pursuaded someone at Crapita that I really wasn’t able to get to an interview and am now having a home visit. Big envelope of papers arrived on Saturday from Capita (the company making huge profits from taxpayers for doing the PIP medical assessments). On my application form I stated that I couldn’t manage an appointment further away than Mansfield; I can’t say in advance whether I will be fit enough to attend on any particular day; and that it would have to be an afternoon. My appointment has been set for Nottingham in 2 weeks and first thing in the morning. I rang Capita this afternoon and that appointment is cancelled but their system wasn’t allowing new home visits to be booked. I’M to ring in a week or two to see if appointments are available. In passing the Capita guy said that all initial appointments are sent out automatically by computer; makes you wonder why DWP had a whole page in the initial application form asking for details of appointment needs and difficulties – they obviously don’t read them. With the appointment pack there were 12 pages, 7 sheets (of 100 gms quality paper) detailing 5 different journey options to get to the appointment. Me, I thought there were only 2 – bus and train. On the positive side they allow 7 minutes for walking the 300m to the bus stop. 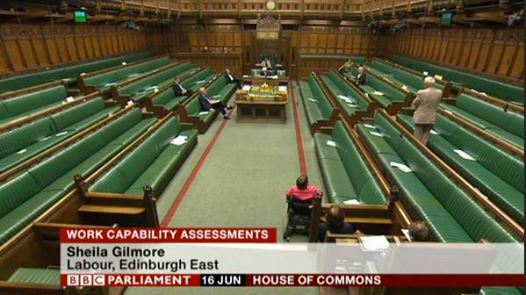 The green benches were almost empty during this week’s debate on the DWP’s new ‘mandatory reconsideration’ regime – and the potential number of deaths it is causing. [EDIT] Remains of the post removed as there is doubt about the authenticity of comments made. Copyright © 2019 Tired Git. All Rights Reserved.